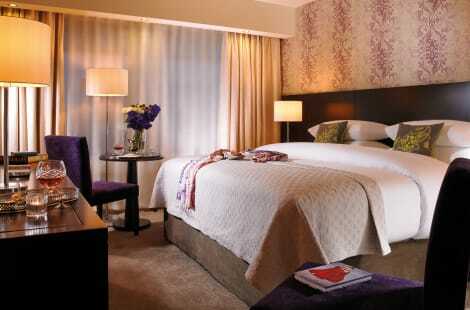 The Connacht Hotel is located on the main Dublin road as you enter Galway city. There is a regular bus route close by the hotel or alternatively Eyre Square is a 20 minute walk. Its facilities include free parking, free wifi and a 24 hour Active Fitness & Leisure Club which has a gym, jacuzzi, sauna, steam room and 20m indoor pool. Bar solo has live entertainment and Rueben's Restaurant serves local dishes. The stylish rooms feature free wifi and LCD TVs. Make use of convenient amenities such as complimentary wireless Internet access, babysitting/childcare (surcharge), and wedding services. Additional features at this hotel include tour/ticket assistance and a banquet hall. 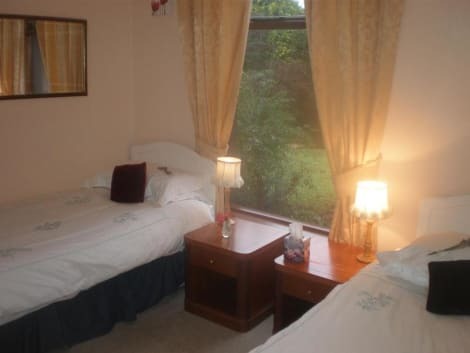 Rusheen Bay House is situated in Salthill, the coastal suburb of Galway, overlooking the famous Galway Bay. Rooms feature TVs and free Wi-Fi. All the rooms at Rusheen have an en suite bathroom with complimentary toiletries, a TV, tea/coffee making facilities, a hairdryer and a safe. Ironing facilities are available on request. Some rooms have a beautiful view of the Bay or the lovely gardens. Continental and traditional Irish breakfasts are served in the dining room, or the conservatory. In the summer months, you can dine al fresco on the garden terrace. The balcony on the first floor is the perfect place to watch the sun go down over Galway Bay. Located just 3 miles from the centre of Galway city, this is an ideal base for touring Connemara, the Cliffs of Moher and the Burren, or the Aran Islands. There are 4 golf courses within a 7 mile radius of the Bay House and Galway Airport is a short 15-minute drive. Free parking is available on site. For lunch or dinner, stop by Grain & Grill Restaurant, a restaurant that specializes in international cuisine. Dining is also available at the coffee shop/café, and room service (during limited hours) is provided. Wrap up your day with a drink at the bar/lounge. Full breakfasts are served on weekdays from 7:00 AM to 10:00 AM and on weekends from 8:00 AM to 11:00 AM for a fee. With a stay at The Western Hotel, you'll be centrally located in Galway, a 2-minute drive from Eyre Square and 6 minutes from National University of Ireland-Galway. This family-friendly hotel is 1 mi (1.5 km) from University Hospital Galway and 17 mi (27.3 km) from Dunguaire Castle. This smoke-free hotel features discounted parking nearby and bicycle rentals nearby. Featured amenities include a computer station, complimentary newspapers in the lobby, and dry cleaning/laundry services. Planning an event in Galway? This hotel has facilities measuring 721 square feet (67 square meters), including a conference center. Free self parking is available onsite. Each of these brand-new city-centre apartments has great views and a great location close to Eyre Square, above Galway's newest shopping centre, The Citypoint. The property offers free valet underground parking for one vehicle per apartment. In each apartment there is a fully equipped kitchen, a spacious lounge with cable TV, a dining area and free, secure underground parking. Guests benefit from 10% off meals in The Western Hotel restaurant, which is just a minute's walk from the apartments. During their stay, guests have access to Snap Fitness gym for a surcharge. Western Citypoint Apartments is run by Western Hotel, which is located nearby. Check-in for the apartments is at the Western Hotel. There is a separate car park for Citypoint Apartments. At the hotel, directions to the Citypoint car park will be given, as well as a fob to gain access. Originally a small fishing village, Galway today is a buzzing, bohemian city steeped in culture and history. Book one of our Galway hotels and explore a city with a thriving arts scene, a stunning coastline and a centre full of cobbled streets, cafés, bars and shops. Hundreds of artists and performers from across the globe flock to the city for the Galway International Arts Festival, Ireland's largest arts festival. Founded in 1978, it encompasses theatre, dance, visual arts, music, literature, comedy and more. The city is also the home of the Cuirt International Festival of Literature, which includes poetry and fiction readings, poetry slams, book launches, masterclasses, music and theatrical performances and more. Galway Arts Centre has a 3,000ft2 gallery which hosts contemporary art exhibitions, and offers classes and workshops in art, writing, photography, drama, music and more. The centre also includes the 80-seater Nun's Island Theatre. Galway's main theatre, the Georgian Town Hall Theatre, offers a daily programme of plays, concerts, musicals, opera, ballet, film screenings, comedy, children's shows and more. There are four main beaches in Galway City. Silverstrand is a shallow, sandy beach where you can swim at low tide and which is popular with young families. Just 250m long, the beach has a cliff on one side, rocks on the other and excellent views across Galway Bay. Salthill beach is a collection of several small beaches, some sandy and some pebbly, and both Salthill and Silverstrand have been Blue Flag beaches since 2006. Nature lovers should head to Ballyloughane, whose wildlife includes flatfish, sand hoppers, seaweeds and crabs, or the sandy Grattan beach, a good place to spot wintering birds. At Galway City Museum, you can discover Galway's archaeology, art, geology, natural history, folklife and social history. The permanent collection has around 1,000 items, including farm implements, carvings, fishing boats, artwork, objects from 19th- and 20th-century shops and photographs of the city through the decades. Galway Cathedral, built in the 1960s, is one of the city's largest and most striking buildings, with a 145-foot-high octagonal dome, and impressive rose windows and wall paintings inside. On the Salmon Weir Bridge, which crosses the River Corrib by the cathedral, you can see the salmon swim up the river in summer, and watch the anglers fishing. The Atlantaquaria, Ireland's national aquarium, is home to more than 150 marine and freshwater species. You can hold starfish and crabs in the touch pools, feed the fish at the estuary, and see seahorses, rays, sharks, conger eels and more. Housed in a 1920s stone cottage, the White Gables restaurant serves traditional Irish dishes, with seafood a speciality. There's also a shop selling homemade breads, cakes and meals to take away, as well as artisan foods ranging from chutneys to fudge. Alternatively, head to the popular Brasserie on the Corner for steak, seafood and cocktails. There are plenty of pubs where you can enjoy traditional Irish music, including Taaffes, The Crane, An Pucan and Monroe's Tavern, all of which have live music every night. Monroe's Tavern has traditional Irish dancing on a Tuesday, which you are welcome to join in.